Enjoy 2 consecutive days at the park, including all of its rides and attractions! More than 40 different rides for an adrenaline filled day. Please note you must visit Chessington World of Adventures Resort on the the date you specify when booking. Please print and present this at the Advanced Sales and Admissions Kiosk upon arrival at Chessington World of Adventures Resort in exchange for your entry tickets. 1 day’s admission to Chessington World of Adventures Resort, including all of its fantastic rides and attractions! Enjoy 2 consecutive days at Chessington World of Adventures, including all of its fantastic rides and attractions! What: Theme park and zoo. Availability: Daily (depending on season). Don’t Miss: Watching Alex, King Julian, Gloria, Mort, Marty and The Penguins in the hilarious Madagascar Live! Show. 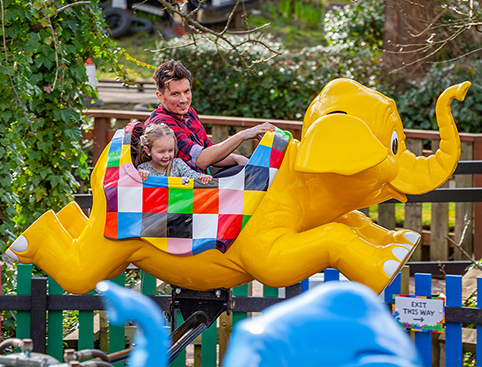 Ten amazing themed lands, over 1,000 animals from around the world, more than 40 rides and attractions – no wonder a visit to Chessington World of Adventures is one of the nation’s most exciting and educational family fun days out! Experience a spell-binding adventure as you searh high and low to help Dog, Bird and Frog on their way to find lost belonging. Make sure you keep an eye out for the fearsome foe Dragon! Explore Europe’s 1st overhead tiger trail! A family of endangered Amur Tigers comes to Chessington this May in the brand new Land of Tiger! There is something for everyone at Chessington World of Adventures, with fun and excitement for thrill-seekers, tiny tots and everyone in between virtually guaranteed! 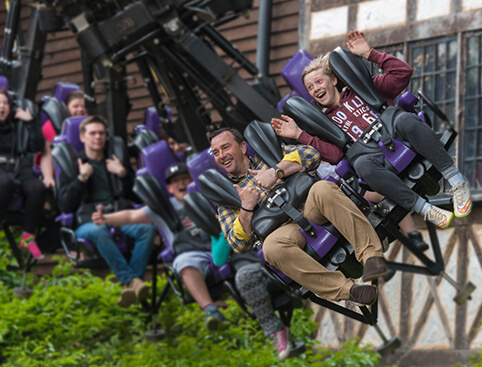 Fast and furious attractions include the hair-raising Extreme Games Zone, gravity defying Rameses Revenge, Rattlesnake, Black Buccaneer and many more! 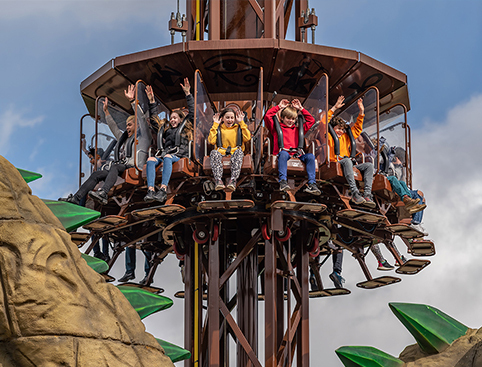 Younger visitors to Chessington World of Adventures will love Dragon Falls water ride, the Flying Jumbo, Griffin's Galleon and the incredible Vampire which, with a height restriction of 1.1 metres, is one of the few serious rollercoasters in Europe designed with children in mind. The Gruffalo River Ride Adventure! 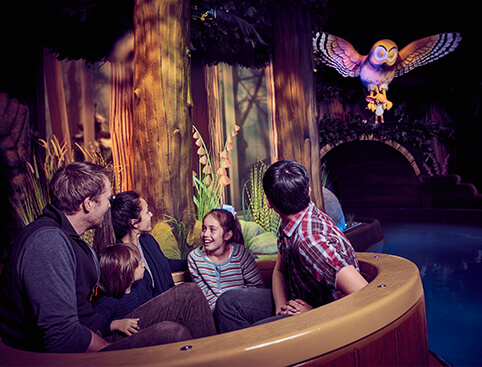 Embark on a perilous journey through the world of fairy tales on the world’s first Gruffalo ride – The Gruffalo River Adventure. Sail down the lazy river through the dark woods and meet the magic Gruffalo himself. Where to begin at Chessington World of Adventures Zoo? Possibly with the Trail of the Kings and its gorillas, lions, leopards and tigers, or maybe with the meerkats and wallabies in Creature Features, or perhaps with the oh-so-cheeky inhabitants of the Monkey and Bird Garden? And don’t miss a visit to the Children's Zoo where little ones love to cuddle their favourite furry creatures! The Sea Life Centre at Chessington World of Adventures, is a 250,000 litre aquarium set within the zoo, showcasing over 20 attractions featuring exotic marine creatures from stingrays and clownfish to sharks and shrimps! Whilst at the Sea Life Centre, take a stroll through the walkthrough ocean tank, a glass tunnel with a watery-world of marine-life swimming overhead. The theme park main season is open daily between 10 March – 4 November 2019. The theme park is closed on the following dates: 12-13, 19-20, 26-27 March, 30 April, 1, 7-8, 14-15, 21-22 May, 10-11, 17-18, 24-25 September and 1-2, 8-9, 15-16, 22-23 October 2019. Howl’o’ween: 19-20, 25-31 October and 1-4 November 2019. We also recommend you check opening times with the Park before your visit. 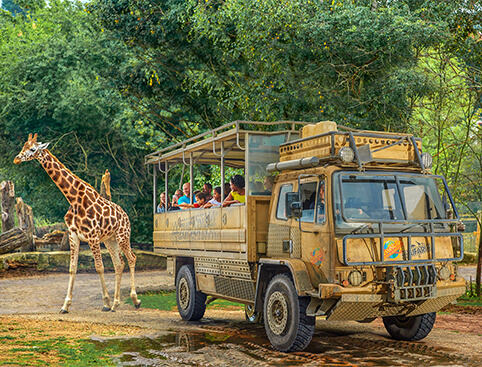 Chessington World of Adventures is located on the A243, just two miles from the A3 and M25 (junction 9 or 10). Children aged between 3-11 years of age require a child ticket. Those aged 12 years and over require an adult ticket. Children under 3 years enter Chessington World of Adventures completely FREE! There are restaurants and bars offering something delicious to suit all tastes at Chessington World of Adventures. Parking is available on site at £3.00 per car (including blue badge holders). Chessington World of Adventures and Zoo provide wheelchairs on a first-come, first-served basis. Disabled guests unable to use normal queue lines may visit the Guest Services Office where preferential use wristbands allowing access to rides via specially designed entry points are available. Accessible restrooms are available throughout the Park. Chessington World of Adventures Resort is located on the A243, just two miles from the A3 and M25 (junction 9 or 10). It is a 5 minutes walk from Chessington South train station. Opening Times: 19-20, 26-31 October and 1-3 November: 10am-8pm. 25 October and 4 November: 10am-6pm. Chessington World of Adventures Resort offers hair-raising Howl’o’ween fun for the whole family - experience brand new scary attractions, spooky story time and spooktacular family-friendly shows. Test your courage on Chessington’s scariest attraction yet! Would you risk it all and follow our Secret Agents through a quarantined snake enclosure, just to get an exclusive look at a newly discovered plant species? With Zoo Keepers missing and strange things happening – you may want to consider Chessington’s warning - ‘enter at your own risk’. Spooky storytelling for young adventurers with characters from Julia Donaldson and Axel Scheffler’s much loved story. Meet the witch with ‘a very tall hat’ and find out if there is room for you and your family on her ‘truly magnificent broom’. Here’s a returning favourite! – Delve into the secret lost tomb of Genghis Khan if you dare! The Curse of the Lost Tomb maze is sure to get toes tingling and hearts beating once again. Trick-or-treating with a twist! - Choose a path past the bewitching tree and see where it leads you - will it be a tempting treat or a troublesome trick waiting at the end? Take a flight on Chessington’s favourite rides after dark! - soar through the trees on Vampire, spin underneath the stars on Dragon’s Fury’s, or incur the wrath of Rameses’ Revenge under the night sky. Chessington World of Adventures Resort Tickets is rated 4.3 out of 5 by 8. Rated 3 out of 5 by Nsu007 from Good day out but ruined Bought tickets last minute on the door via o2. The staff working in the ticket box told me its find to buy it online. So literally bought it in front of him. He then cleverly tell me that the tickets are a third party so they won't let me in without a printout version which is a joke. Where on earth am I to get a printer in the middle of chessington. I had to go to the chessington hotel to print it out. On top of that some rides were not running. Rated 4 out of 5 by Hawk from Fun family day out We were looking for a family day out that suited different age groups. There was something for the older kids and the younger ones enjoyed the zoofari and aquarium, great day out. Rated 3 out of 5 by Gabi from Great time Be bought the tickets from Attractiontix website and we get a very good deal . We had a good time and fun . I recommend 2 days otherwise not enough time to visit the park and do all the rides . You can buy a fast track entrance but our budget won't fit for the prices . I found being very expensive this priority entrance . Good for kids and adults . Rated 5 out of 5 by TJR from Fantastic day out Such a reasonable price for such wonderful memories at chessington!